My project focuses on testing whether genes identified from sequencing genomes of human patients diagnosed with motor neuron degeneration would cause degeneration of the nervous system of fruit flies and affect their flight behavior. I performed flight tests when flies were 2, 10 and 30 days old to see if experimental flies with reduced levels of each of the candidate genes decreased flight performance. I also used a confocal microscope to visualize the neuroanatomy of old flies to assess evidence of degeneration at the cellular level in control and experimental flies. 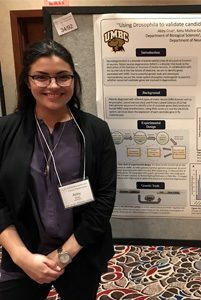 After conducting research on biological factors that affect pain perception and neurobiological mechanisms that influence pain processing in humans under Dr. Raimi Quiton in the psychology department, my research interests changed to wanting to understand different mechanisms to neurodegeneration using model organisms. I knew I was interested in neuroscience so looked up professors on the biology department who had similar research interests as me. I inquired with Dr. Rachel Brewster about my research interests and referred me to Dr. Fernando Vonhoff who, at the time, was an incoming research professor. I chose him because even before coming to campus, he was very motivated by my interests as a researcher. I sent him different articles and talk to him about what my specific interests were and he would relate my interests to what we could do in lab. That first, I was excited to hear that I could perform an experiment without having to wait for weeks for institutional review boards (IRB) or trainings. I was hooked! I was immediately interested because of the collaboration part of this project and how I would be researching a different type of degeneration. We collaborated with the Yale School of Medicine to obtain a list of genes from sequencing data from human patients to be used in a fly model version. I also was interested in the project because I made a connection between the research in the lab and the research I was coordinating in a neurology clinic. When I first became interested in the project, I was the practice coordinator for the IDEAS Study, a nationwide study supported by the Alzheimer’s Association. Our patients diagnosed with mild cognitive impairment, precursor to dementia, would participate in the study with the idea that PET scans with a special radioactive tracer would prove as an important diagnostic tool in diagnosing Alzheimer’s disease. Both my research in the lab and the research I was preforming in the clinic showed different angles to approaching a human disease, neurodegeneration. The hardest part about my research is not getting discouraged when certain assays don’t work out the best. Apart from preforming tests to see how the flies’ behavior would change with the gene manipulation, I also would look at their anatomy to see signs of degeneration. I would do this by performing microdissections of fly brains, which I would struggle with. My anxiety disorder causes me to shake, especially when using fine movements, which inevitably ruins the dissection. After much practice and having more patience for myself, I eventually would end up with cleaner dissections to use for analysis. The most unexpected thing about being a researcher is having realized how much I enjoy doing research and how it has changed my career goals! Before coming to UMBC, I had a mindset that after my undergrad, I would peruse only medical school however, that changed when I started doing research. I love asking questions, learning about the most up to date advancements in science, performing experiments, collecting and analyzing data, and being involved in the scientific community. Hands down, talking with people of all different backgrounds about my research and how it relates to human health. I love watching people’s faces light up when I talk about how a little fruit fly can play a vital role in understanding human disease and knowing that I can make someone without a science background understand my research. I will be presenting my research at the University of Maryland (USM) LSAMP Fall Research Symposium in December 2018. I have had the opportunity to present my research this past October at the STEM Research and Career Symposium at Emory University. I also presented my research at the New England Science Symposium at Harvard Medical School and the Undergraduate Research and Creative Achievement Day (URCAD) April, 2018. We will soon be submitting the research for publication. One piece of advice for students getting involved in research is letting your passion fuel your research interests and goals. On the days where experiments aren’t working, scientific literature seems like it’s written in another language. It is good to have underlying initial passion for the research topic to help motivate you get through difficult times. On the days where I’ve had to test over 50 flies individually, it always helps knowing that each data point contributes to making break-through research. I intend on pursuing an MD/PhD or DO/PhD with a focus in neuroscience and cannabis science. I want to study the role of cannabidiol (CBD, the non-impairing psychoactive constituent of cannabis) in the endocannabinoid system and its anti-inflammatory and neuroprotective properties as a possible treatment for neurodegenerative disorders such as Alzheimer’s disease. One of my biggest goals is to contribute to the knowledge of alternative medicines especially for when pharmaceuticals have failed or when patients do not fit the criteria for medication. I also want to dive into the idea of using personalized medicine structured for a person’s unique depleted endocannabinoid system. My goal is to focus on palliative care rather than aggressive treatments or procedures so that patients can live their lives to the fullest capacities despite having severe disorders.